Check out Multi-syllabic Word Party, an interactive app for helping children learn and strengthen phonological awareness skills. This list of functional words was professionally selected to be the most useful for a child or adult who has difficulty with producing Multi-syllabic words. 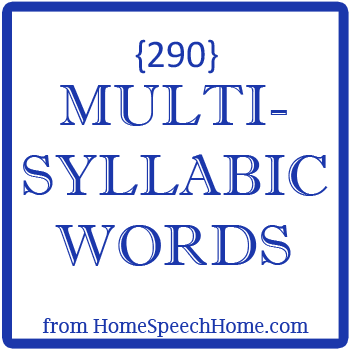 Every day that your child goes without practice it becomes more and more difficult to correct Multi-syllabic words error because he/she continues to say it incorrectly.